You can discover more about this wonderful toy collection in Miss Frugal Mommy's review! Now for the exciting part! 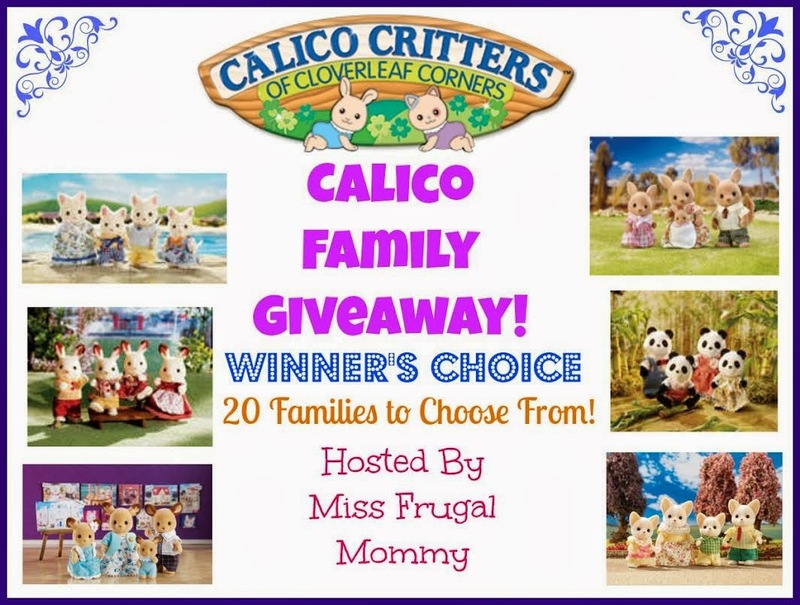 One lucky fan is going to win a Calico Critters Family of their choice (RV $22.95.) There are 20 different families to choose from, which you can view here! This giveaway is open to US residents 18 and older. Enter to win in the rafflecopter below, all entries will be verified, one entrant per household or you will immediately be disqualified. Winner will be contacted via email and has 48 hours to respond before a new winner is chosen. Good Luck!!! These are all so adorable! Hard to choose just one honestly! Hmm I like both rabbit families and The Outback Koala Family! I have always wanted to go to Australia :) I know my kids would love to play with these! Thank you so much for the opportunity to win! I think going to Australia would be so awesome! Good Luck! They are all so cute. Since Easter is coming upni would choose the Cottontail Rabbit Family for my niece Stella.